Where a higher level of security is required than can be achieved with a standalone Safe (maximum security rating for a conventional type safe is £150,000 cash), a de-mountable strongrooms could provide the answer. 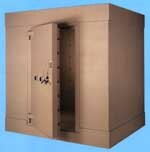 Unlike a permanent structure such as a vault, a de-mountable unit can be dismantled and relocated should circumstances demand it. The nature of a demountable unit also means that for accounting purposes, such units are classed as plant and machinery, thus potentially offering certain tax advantages over permanent structures. ... and remember you may be able to save money by purchasing a professionally refurbished unit. Designed to offer protection against all forms of attack including: diamond core drilling and staggered multiple explosive charges. Each of the robust wall sections fully interlocks with adjacent wall, roof and (optional) floor sections. During installation panels are bolted together internally for maximum security. These versatile units obviously require specialist installation. As their weight is measured in Tons, the location of the unit must be carefully considered, especially with regard to floor loadings, etc. where the proposed location is not onto solid ground.